Singha is the original beer of Thailand, still brewed by the same family and imported from Bangkok. 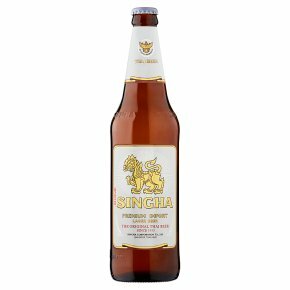 Singha perfectly complements the vibrancy of Thai and other spicy foods - refreshingly dry, the palate is light, fragrant with herbs and honeyed citrus, with a rounded, bitter hoppy finish. With a floral peppery aroma and fresh zesty, hoppy bitterness in taste. This easy drinking quality Pilsner style Lager is perfect to enjoy with or without food. Singha 5% Premium Lager. Singha Beer has a floral peppery aroma and fresh zesty, hoppy bitterness in taste. Its sweet, earthy and spicy flavours is the perfect accompaniment to all Asian cuisine, or to enjoy on its own. Brewed in Thailand since 1933.